Writing a newsletter takes time and effort, so why not do it right. Get the most out of your newsletters and get your clients to look forward to your next newsletter. Here are 3 points that will guide you to having efficient and effective newsletters. Many businesses that send out newsletters do so randomly or too often. Most businesses do not need to send out weekly or even monthly newsletters. Choose a frequency that fits your businesses’ services or products. You can send out a newsletter weekly, monthly, quarterly, semi-annually, or even annually. For some businesses, the newsletters timing could be set by holiday occasions. Whichever you choose, stick to it. If you have a quarterly newsletter and something comes up between the newsletters that you feel is worth sharing, then either have that information wait for the next newsletter or send it as an email that is clearly a one-off and not your newsletter. Clients will not be happy if they start getting your newsletters more often than expected. This is a quick way to have them unsubscribe. Set a schedule for your newsletters and stick to it. Remember that a newsletter should contain news (new information). Not all of your newsletters need to be promotional; you can provide tips and information that is valued by your readers. Take your most asked questions from your clients and turn them into an informative education piece or take a creative idea you have for your product or service and share it as a solution to fit your clients’ needs. Your newsletter should build you up as an expert in your field. Your audience may not buy from you every day, but when they are ready to buy, you want them to remember you as the expert that they feel comfortable with. 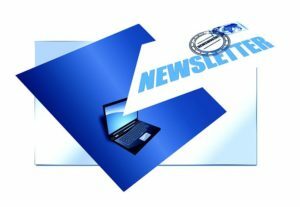 The most effective newsletters are easy to read and easy to understand. Make the purpose of your newsletter clear from the beginning. The first few lines should clearly identify what is contained in the newsletter or what is new that you are sharing. Try to restrict your newsletter to 2 or 3 images with fewer than15 lines of text per image. Make the newsletter news worthy, not an overload of information that your audience will give up on half way through viewing. Use links back to your website for more information. Don’t try and put everything you want to say in the newsletter. If you can entice them with a great promotional picture or graph that they click on for more information, then you gain two benefits from the link; first, you get those that are most likely to purchase to read the added information and second you get them to your website where they will see other services and products you may offer. Driving traffic to your website is a key aspect of any newsletter. Don’t forget to have your social media channel buttons available to increase your audience on those channels.